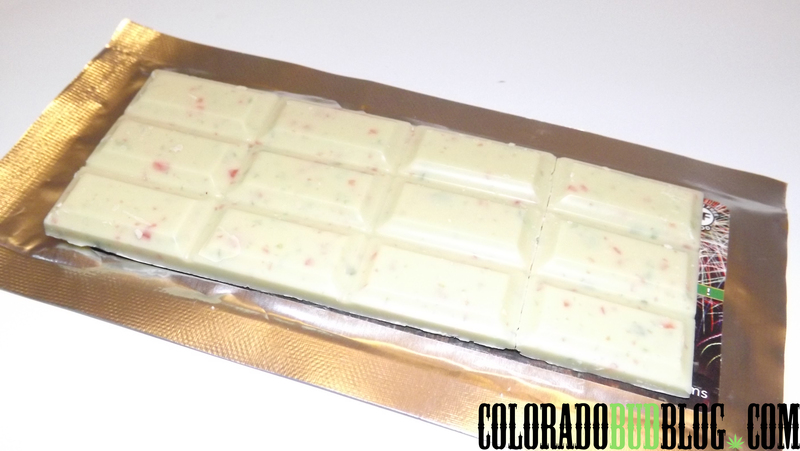 Limited Edition Firecracker White Chocolate Bar from Incredibles Edibles. It is white chocolate with pieces of Pop Rocks mixed in! It is Limited Edition for New Years 2014. It is a bummer that this is only Limited Edition, because I think it is a great edible! This picture isn’t very good at all, but I can’t take another picture because I already ate the whole thing! You can see that it is already divided into 16 pieces, which makes it easy to get the exact dosage you need. 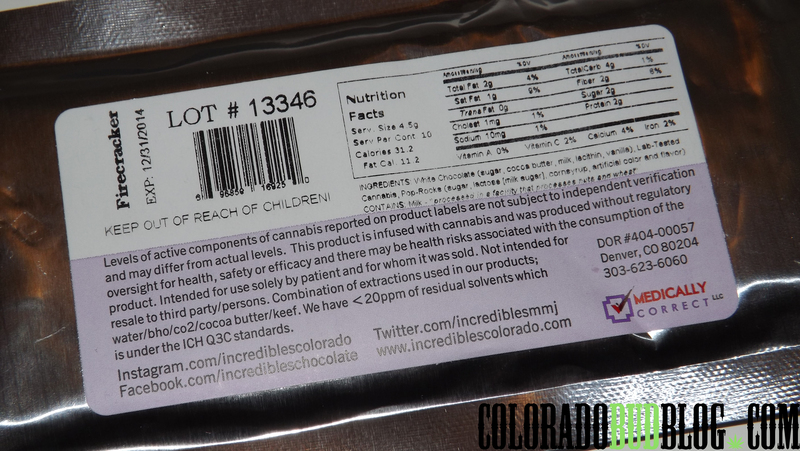 The whole candy bar is 100mg THC, making each piece about 8.33mg THC. 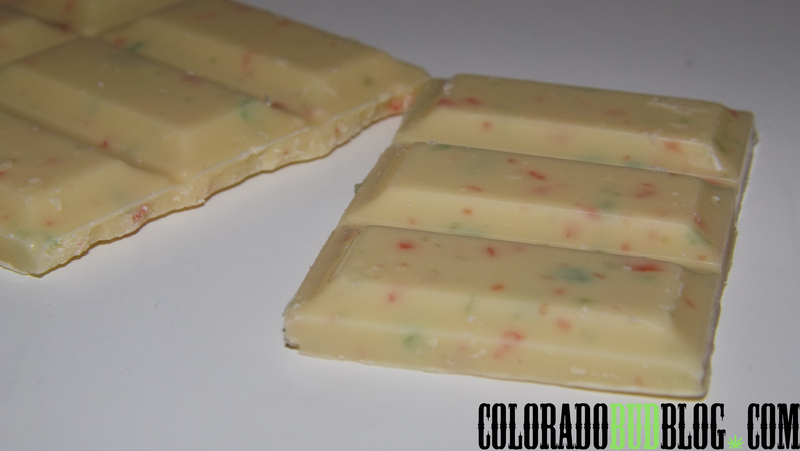 Upon closer inspection, you can see all the colorful pieces of Pop Rocks Candy in the creamy white chocolate. I LOVED how this edible tasted. The white chocolate was very strong, but the Pop Rocks give it a sweet, Fruity Pebble-like taste, and of course they gave it a nice crunch! The fruity taste stays in your mouth while the Pop Rocks explode like fireworks! Even though this bar is only 100mg THC, it is really doing the trick for me right now! It doesn’t say what strains were used for this bar, but my guess is more towards a Hybrid strain, as I feel very relaxed and my mind has slowed down a lot, but I am still alert. I really enjoyed this edible, and I HIGHLY RECOMMEND this to anyone who wants white chocolate with a little extra fruity flavor to it. Act fast though, as they are Limited Edition! 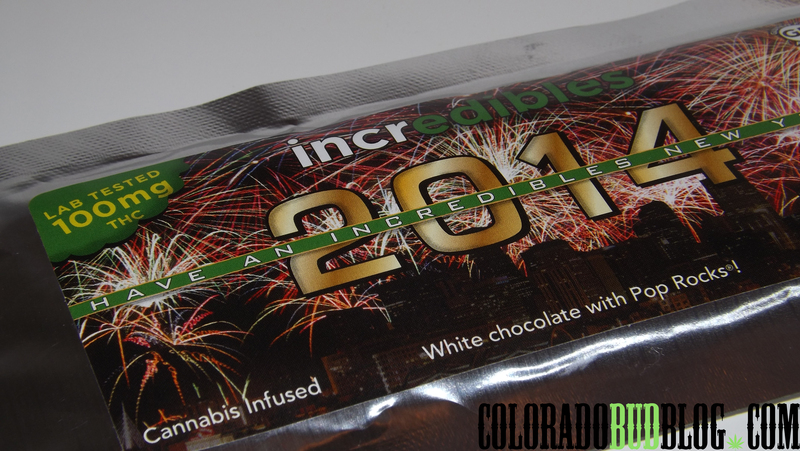 Pick some up at Durango Organics if you are in the area, and check out more Incredibles Edibles at http://www.incrediblescolorado.com! Thanks for checking out my review, and stay high!